Windows PowerShell 2 is the scripting language that enables automation within the Windows operating system. Packed with powerful new features, this latest version is complex, and Windows PowerShell 2 For Dummies is the perfect guide to help system administrators get up to speed. Written by a Microsoft MVP with direct access to the program managers and developers, this book covers every new feature of Windows PowerShell 2 in a friendly, easy-to-follow format. 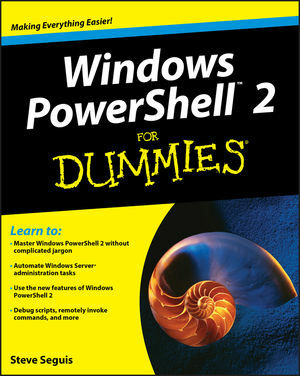 Windows PowerShell 2 For Dummies makes this tool easily accessible to administrators of every experience level. Steve Seguis is a Microsoft Windows systems engineer with more than 12 years of experience managing small- to large-scale Windows environments. He was a Microsoft MVP for Windows Server - Admin Frameworks from 20042007, and is a contributing technical editor for Windows IT Pro.